Too often, it seems, Christians face troubles and problems. Why? And what does the Bible say about how to survive them and even grow through them? Jesus Christ’s half-brother James wrote a letter of exhortation and encouragement to scattered Christians whose lives were not easy. In the first chapter of James’ letter, he addressed issues Christians face that have the potential to discourage or cause them to fall away from the faith. The first topic was that of personal trials. We all have trials from time to time in our lives. They can be financial trials caused by the loss of a job, an illness, the breakdown of a car or appliance. They can be relationship issues with one’s mate or children, a serious health problem or even the death of a loved one. When these things happen, understandably we often see only the negative side of the trials. They can discourage us and make us want to just give up. 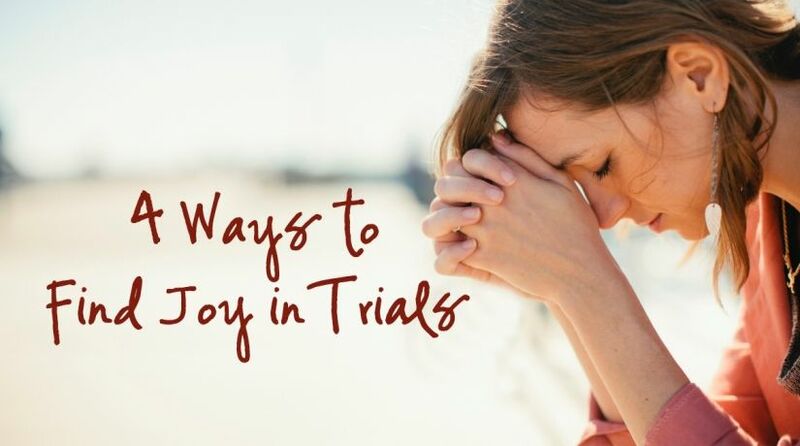 But James wrote, “My brethren, count it all joy when you fall into various trials” (James 1:2). “Count it all joy”? Was James living on some other planet? Was he living in la-la land? How can you be joyful about something that brings you anguish, heartache and pain? Did he think Christians should be masochists? No, he was not saying we should enjoy misery. “In this you greatly rejoice, though now for a little while, if need be, you have been grieved by various trials, that the genuineness of your faith, being much more precious than gold that perishes, though it is tested by fire, may be found to praise, honor, and glory at the revelation of Jesus Christ, whom having not seen you love. Though now you do not see Him, yet believing, you rejoice with joy inexpressible and full of glory” (1 Peter 1:6-8). Realistically, though, sometimes the joy doesn’t come until later, after the trial is over. The author of Hebrews said, “Now no chastening seems to be joyful for the present, but painful; nevertheless, afterward it yields the peaceable fruit of righteousness to those who have been trained by it” (Hebrews 12:11). James went on to write, “Knowing that the testing of your faith produces patience. But let patience have its perfect work, that you may be perfect and complete, lacking nothing” (James 1:3-4). The apostle Paul added, “And not only that, but we also glory in tribulations, knowing that tribulation produces perseverance; and perseverance, character; and character, hope” (Romans 5:3-4). Trials and difficulties are a reality of this life. They happen to everyone, even those who are trying to live a good life. “Many are the afflictions of the righteous, but the LORD delivers him out of them all” (Psalm 34:19). But if we realize that there are valuable lessons that can be learned as we go through them, then we can turn a negative experience into a positive one. It is through these kinds of trials that we learn to look to God to supply our needs and to give us guidance. They help to refine and build the kind of character we’ll need to enter the Kingdom of God. And by inner reflection and examination of our motives and actions, we can become wiser in the way to live our lives. The psalmist stated, “It is good for me that I have been afflicted, that I may learn Your statutes” (Psalm 119:71). 1. Pray for help to learn from the trial and to not get discouraged. Depression and discouragement are common problems people have in times of trial. In some cases, they see no reason why this is happening to them. Maybe they have been trying to live a decent life and now something bad happens. James added that while we are in that period of trial, we should ask God to show us what we can or need to learn from it. “If any of you lacks wisdom, let him ask of God, who gives to all liberally and without reproach, and it will be given to him” (James 1:5). There are a number of things trials can teach us, such as the need to draw closer to God for His help and guidance. A very important lesson He wants us to learn is to depend less on ourselves and more upon Him. There are a number of things trials can teach us, such as the need to draw closer to God for His help and guidance. A very important lesson He wants us to learn is to depend less on ourselves and more upon Him. 2. Pray for guidance in getting out of the trial and for help to see if there are things you did to bring it on or that might cause it to happen again. Not only is there a cause for every problem, but there are also solutions to most. God can show us how to resolve them without compromising on what is right. We need to go to Him for those answers. “You are tempted in the same way that everyone else is tempted. But God can be trusted not to let you be tempted too much, and he will show you how to escape from your temptations” (1 Corinthians 10:13, Contemporary English Version). Peter wrote, “The Lord knows how to deliver the godly out of temptations and to reserve the unjust under punishment for the day of judgment” (2 Peter 2:9). There are occasions when we do bring troubles on ourselves. And if that is the case, we must recognize it and stop doing whatever it is in order to find the peace that comes from conducting our lives in a more prudent manner. “If you are reproached for the name of Christ, blessed are you, for the Spirit of glory and of God rests upon you. On their part He is blasphemed, but on your part He is glorified. But let none of you suffer as a murderer, a thief, an evildoer, or as a busybody in other people’s matters. Yet if anyone suffers as a Christian, let him not be ashamed, but let him glorify God in this matter” (1 Peter 4:14-16). 3. Cast your cares on Him for He cares for you. God, who gives us life and all the things that make life enjoyable, is not indifferent to our sufferings. He has great plans for us in the future. He is molding us to become His children for all eternity. In order for that to happen, changes must take place in our character. We have to become like Him. That process includes trials and testing. With His help, we can place the outcome of the trial in God’s hands and in confidence know that in some way good can come to us if we stay true to His ways. In time deliverance will come and things will get better. “And we know that all things work together for good to those who love God, to those who are the called according to His purpose” (Romans 8:28). 4. Pray for faith and patience. There is an old saying that has much truth in it: “This, too, shall pass.” Maybe not as quickly as we might wish at the time, but eventually, with faith and patience, things will get better. “Those who sow in tears shall reap in joy” (Psalm 126:5). Even if God in His fatherly love sees a need to chasten us to bring us back to a right way of life, He will then bless us when we learn and turn to Him. The short time we spend in the midst of a trial is nothing compared to forever as His children. “For our light affliction, which is but for a moment, is working for us a far more exceeding and eternal weight of glory” (2 Corinthians 4:17). “The Spirit … bears witness with our spirit that we are children of God, and if children, then heirs—heirs of God and joint heirs with Christ, if indeed we suffer with Him, that we may also be glorified together. For I consider that the sufferings of this present time are not worthy to be compared with the glory which shall be revealed in us” (Romans 8:16-18). And don’t hesitate to contact us, as we would like to help and pray for you as you work your way through them. We have ministers all over the world who have years of experience in serving those whom God is calling in this age. You can use our “Ask a Question” page to send questions and requests.